Mobomo was selected by CSBA to build the new version (3.0) of its proprietary Strategic Choices Tool. The tool is used by CSBA’s clients to modify the President’s national defense budget request by simulating military budget spending (investments/divestments) in a custom exercise and dataset. The goal is for the tool to allow teams to understand tradeoffs between platforms, R&D, personnel, etc. that must be made under different budget scenarios. Given the substandard code quality and security of the existing tool, Mobomo re-architected the entire system for the new Strategic Choices Tool from the ground up, using a Ruby on Rails backend and React front-end. Mobomo first met with the CSBA team for initial strategy and on-boarding sessions in order to better understand the existing issues, frustrations, and needs. Mobomo's UX Design team then redesigned the interface to modernize and simplify the user flow on both the Administrator side, as well as the end User's side. The first phase was an iterative, agile development phase to build out version 1 of the new tool. Mobomo completed version 1 of the new Strategic Choices Tool in time for a live exercise with one of CSBA's clients. 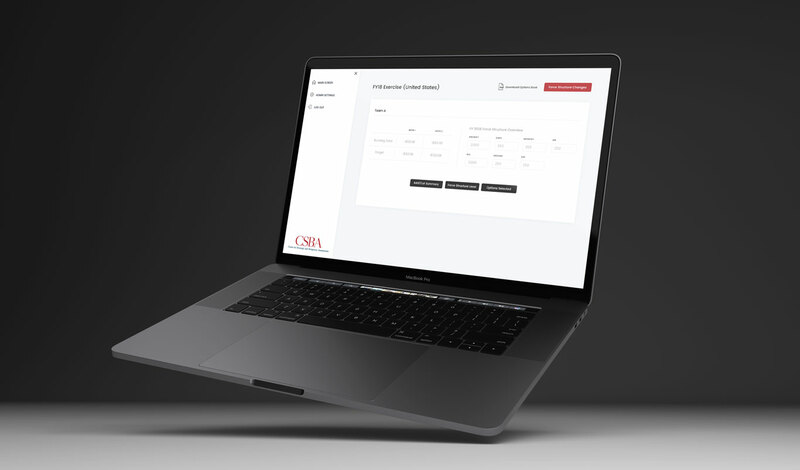 The CSBA team was able to utilize the new, improved tool for the first time and received increased interest for additional exercises. Due to the new tool's improved capabilities and streamlined/automated workflow for creating new exercise datasets, CSBA was able to accept additional exercise contracts for the upcoming year - something that would not have been possible with the old tool due to the amount of (previously) manual calculations needed to create a dataset. Phase 2 was a major update and included the addition of many complex enhancements to push the new product past the existing platform’s feature set. Most significantly, this included the incorporation and automation of 20 formula models - all previously executed manually by the CSBA team. 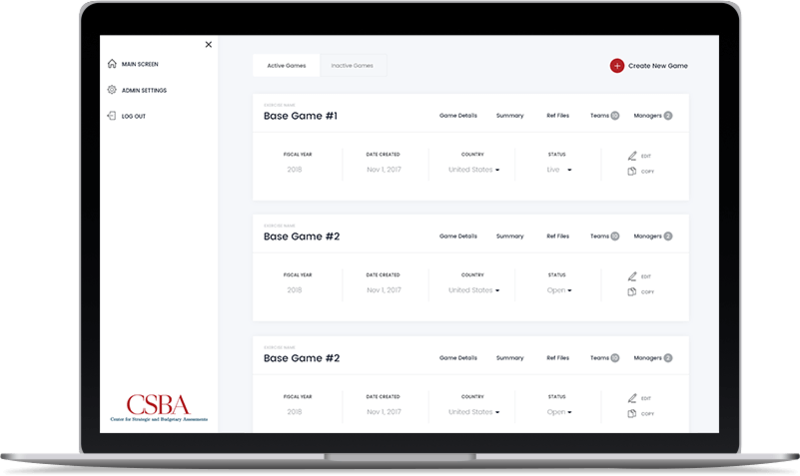 Additionally, dozens of enhancements were made to streamline and simplify the exercise creation and management process, which vastly increased the speed at which the CSBA team can build databases and conduct additional exercises. On the new Admin portal, administrators are presented with a clear dashboard of all existing exercises. They can jump into each exercise to see/edit high-level exercise data as well as the minute details of all Categories, Force Structures, Parent Options, and Child Options available in an exercise. Admin can also access Summary data for all Teams to analyze their selections made, overall adds/cuts in spending, and force structure inventory changes. On the User/Team side, a cleaner interface with intuitive navigation allows for a more seamless experience working through an exercise. A constant view of total spend and force structure inventory levels allows the user to better understand how each of their selections affect their end result, while interactive graphs and tables provide deeper insight in real-time. 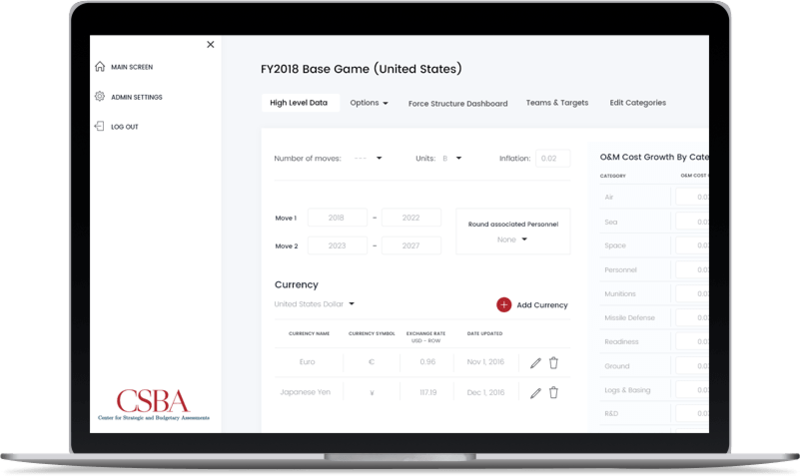 The tool is used by CSBA's clients to modify the President's national defense budget request by simulating military budget spending (investments/divestments) in a custom exercise and dataset. The goal is for the tool to allow teams to understand tradeoffs between platforms, R&D, personnel, etc. that must be made under different budget scenarios.